This was a difficult trip on multiple levels. Weather and road conditions prevented me from spending much time in our core search area, and a bad chest cold kept me out of the field almost entirely on the 26th. On that day, all I could manage was a morning, roadside stakeout of an intriguing cavity, in a pine snag a few miles from the core of the search area. (Frank will be posting a write up of that event and his perspective on it in the near future.) To our chagrin, the new game cam, which we had aimed at the spot where Frank had the sighting earlier this month, shut down about an hour after we left it. We suspect this was due to was some kind of card programming error on our part that Frank will try to address. That said, the image quality is far superior to our old cameras, and once we’ve worked out the bugs, we expect that the percentage of unidentifiable blobs will plummet. Despite the challenges, the trip was still a productive one for a number of reasons. We were able to develop some strategies for reaching the more inaccessible areas when I return in June (provided water levels subside), and I was able to get some new insights into the feeding sign found on the last couple of trips and to make comparisons with other locations, even though I found no fresh work during my limited time in the core area. On the 22nd, I drove to the trailhead; the access road was in poor condition due to the quantity of rain over the past month, and I nearly got stuck in a couple of spots. While a truck or 4-wheel drive vehicle would not have encountered any problems, I was mindful of the possibility of getting stranded in my small rental car, a very unappealing prospect. Heavy thunderstorms were predicted for the afternoon. I spent the morning in the area where Frank had his sighting and where there’s a concentration of scaling but did not see or hear anything suggestive, despite doing some playbacks and double knocks. What may be significant in future is that I found a large, live sweet gum limb that had blown down very recently. The base was embedded in the ground and the top was perhaps 20’ high. This presents us with an opportunity to monitor a potential feeding site for an extended period (once we’ve resolved the camera issues). At present, there are no signs of insect infestation in this blowdown, and we’re discussing the optimal time to begin the monitoring. Cell phone access is spotty at best, so I was unable to monitor the local radar; shortly before noon, the skies darkened, and the air felt threatening. I decided it would be best to get out of the woods rather than risk getting stuck, retrieving the trail cam on my way out. As it happened, the rain didn’t start until much later in the day. The forecast for the 23rd was even more ominous, with severe thunderstorms predicted for the area beginning late in the morning. Based on the forecast, I opted to visit some public land near our original search area for the first time since 2012. Some of the intriguing recordings from 2010 were obtained there, and I found some suggestive bark scaling in 2012. This area has a great deal more standing water than where we’re currently focused, and the bugs were awful, gnats in particular. The diversity of the habitat makes it a great birding spot; it’s a fairly long walk into the mature hardwood areas, and I covered about eight miles round trip. The habitat is pretty impressive, and much of it is very inaccessible and unvisited (few people go off the ATV trails.) The forest is impressive – very mature second growth. The soil type is not the same as in our current search area, so the understory composition and secondary tree species are somewhat different, but as in much of our search area, oaks and sweet gums predominate. Many of the sweet gums are in the 3’ DBH range, and oaks of between 4’-5’ DBH are not unusual. I did not see or hear anything suggestive, but I found several downed sweet gum limbs that appeared to be infested with the same larvae as the ones in our core search area (more on this below.) None of these limbs had been scaled. Beetle galleries in small limb found near old search area. Identification is discussed below. Infested, unscaled sweet gum limb from near the old search area. I got back to my car shortly before noon, anticipating bad weather and headed back toward Frank’s. Once again, the forecasts were less than reliable. I stopped for lunch, and a squall blew through the area, but the skies brightened. I went to Frank’s, checked the radar, and decided to return to the most easily accessible part of our current search area. This is a location where there have been sightings, auditory encounters, and where we’ve found concentrations of scaling in the past but that does not seem to be very active at present. It is a couple of miles from the concentration in a straight line and considerably more distant if mature bottomland corridors are followed. 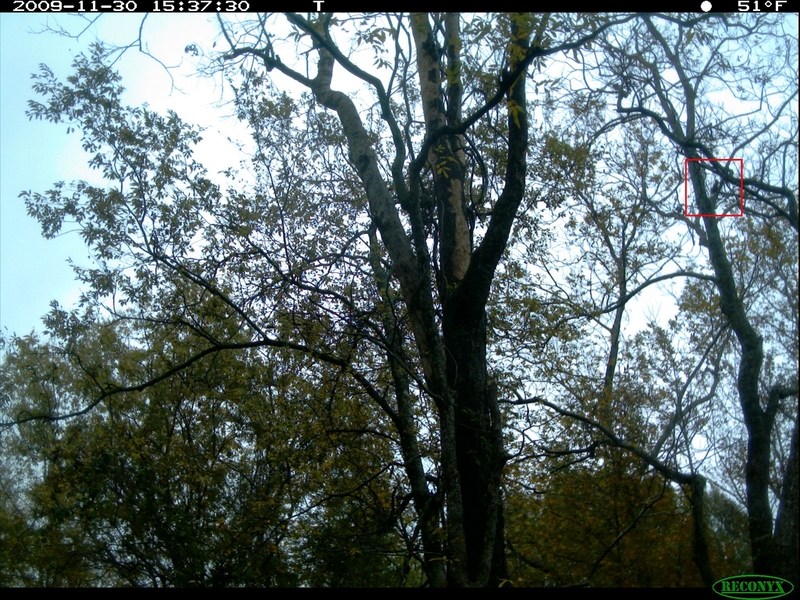 I found a little higher branch work there in February of this year; we heard double knocks in late December 2014, and found this heavily scaled sweet gum in May of last year. I found the same signs of infestation on downed sweet gum limbs in this area but only minimal scaling from no more recently than last fall. This work could have been done before the branch fell. On the 24th, I decided that the best option would be to look for ways to get into the less accessible parts of our search area by walking an old logging road that traverses nearby uplands. The composition of the forest traversed by the old road is mostly hardwood, but it is nowhere near as impressive as the bottomland forest. In many places it is abutted by pine plantations, which play a major role in limiting access to the core area, since the younger plantations are virtually impenetrable. I covered about 5 miles round trip, and made several attempts to find ways into the bottomlands, both by going cross country and by following old logging roads. Only the last of these attempts succeeded, although I didn’t go far because the weather was getting ominous, and I’m not keen on exploring new and inaccessible territory unaccompanied. The near total absence of flagging tape in this area points to how few people go off trail here, and even those who do seldom go into the lower lying areas (I found a deer stand at the edge of an impenetrable pine plantation.) As in the other non-core areas, I found signs of insect infestation in sweet gum limbs but no scaling. The next day (4/25) Frank joined me, and we took his truck to the main access point. We hiked in following a somewhat different cross country route that took us into a perviously unvisited part of the area. Despite a favorable forecast, we got caught in a thunderstorm that lasted for approximately half an hour. We managed to stay almost completely dry during the storm itself but got drenched as we moved through the woods in its aftermath. 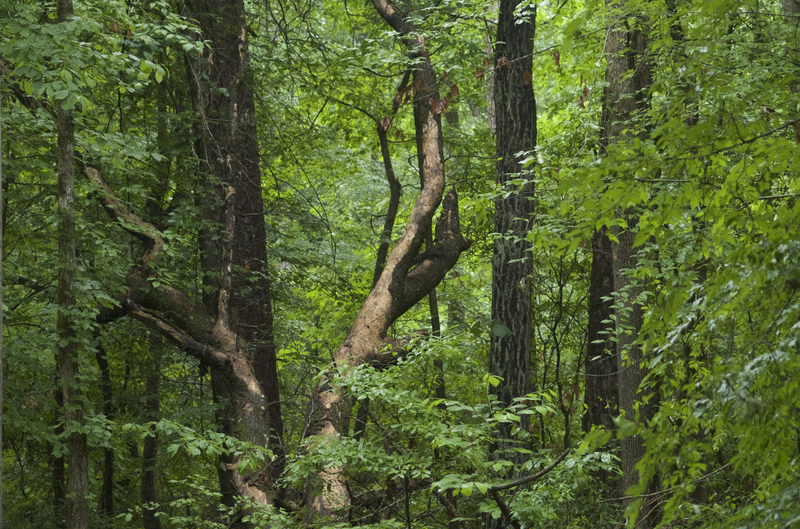 The understory is often quite dense and above head height, which tends to force one to follow the beaten track. Because we’d entered the bottom at a different location, we were forced to fight our way through this dense understory. With full leaf out, looking for feeding sign, let alone ivorybills, is far more difficult. The photo below was taken with my pocket point-and-shoot, on full automatic, through an opening; it should provide a sense of just how hard it is to see anything in much of the search area once leaves are out. My cough grew worse as the day went on, and we left the woods at around 3 pm, without having seen or heard anything suggestive, other than some older scaling on a large limb that had fallen into the crotch of a tree within 30 yards of the spot where Frank had his sighting, likely during the same storm that brought down the live branch. Based on the appearance of the insect tunnels and frass found both in and outside of our core search area, I believe the sweet gum limbs and tops we’re finding are infested with ambrosia beetles (though not always exclusively). There are a number of different species, both domestic and invasive, that feed on sweet gums. While ambrosia beetles are tiny, the females tend to significant numbers of larvae within a chamber. Suspected ambrosia beetle galleries in trunk of smashed sweet gum. Same tree as above. This would make them an attractive food source for a large woodpecker, including an adult ivorybill (though not to feed to a nestling, since Campephilus woodpeckers do not regurgitate). Most ambrosia beetles require live or very freshly dead wood as a substrate for the fungus on which they actually feed. 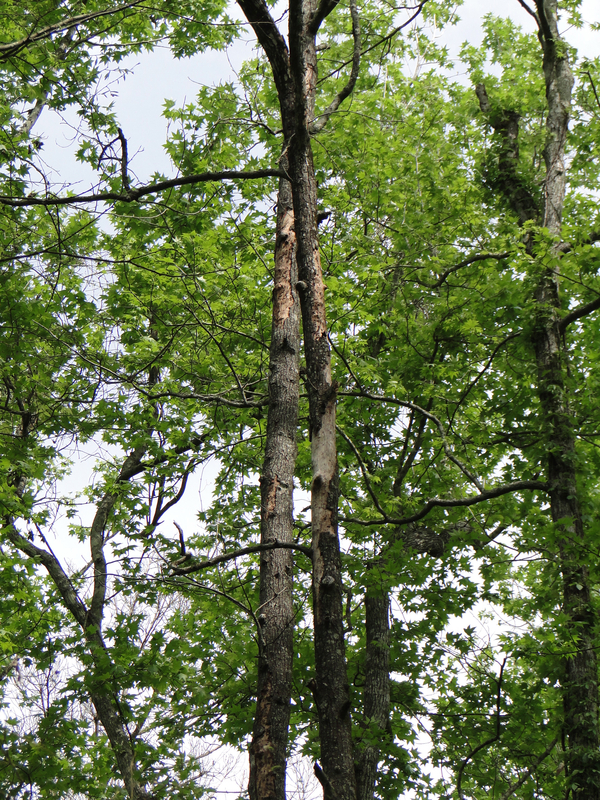 This may shed light on Tanner’s observations regarding high branch scaling on recently dead or dying wood (high branches are not preferred by the larger Cerambycids). This is exactly the substrate required by ambrosia beetles, some species of which are associated with sweet gums. 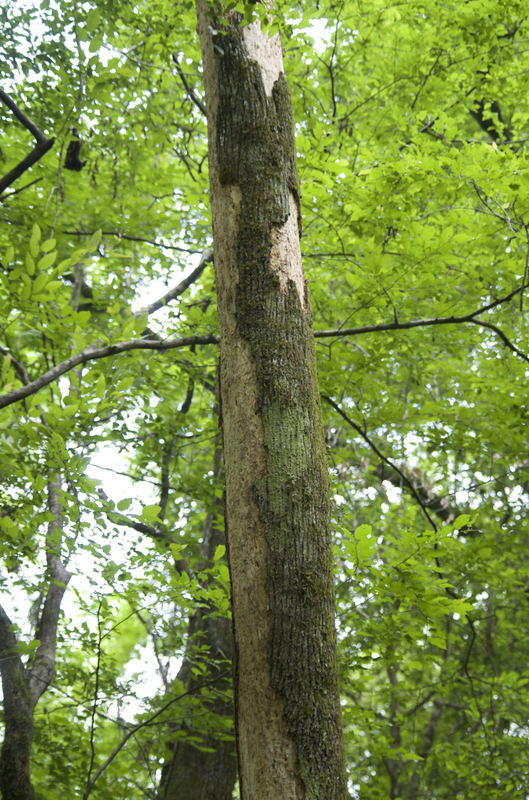 While the larval chambers are not immediately beneath the bark, they are shallow enough, especially on smaller limbs, to be accessed with a blow or two and don’t require extensive digging. There is of course no way to prove this is so (nor are we suggesting that ambrosia beetles might be the sole prey species), but it makes intuitive sense to us and seems to resolve some apparent contradictions between what’s known about prey species and the way Tanner interpreted what he observed.